Having listened to Alistair Carmichael's defence in the matter of what I suppose we must grit our teeth and call #MemoGate, I am even more convinced than ever that he should resign immediately. Unbelievably, Carmichael is now insisting that we should simply ignore his despicable behaviour and focus instead on some unspecified things he may have done for his constituents in the past. Even more incredibly, he is trying to portray the SNP as the villain of the piece! Carmichael's conduct has been, and continues to be, appalling. But the fact that his party refuses to take any action against him is totally inexplicable. They have voluntarily chosen that the whole party should be tainted by Carmichael's offences. We have to assume that this was Willie Rennie's decision, not least because it is backed up by his personal plea that Carmichael be given a "second chance". Such poor judgement must call into question Rennie's fitness as leader. Rennie has foolishly put himself in the firing line of a scandal which is already threatening to embroil Carmichael's successor as Scottish Secretary, David Mundell as more and more people ask how he could possibly have been unaware of what his then boss was up to. After all, it's not as if Carmichael was acting in a particularly clandestine manner. One of the more shocking aspects of this whole affair has been the casual attitude to deliberate smears and brazen lies displayed by the main players, and the fact that Carmichael believed he could act as he did with impunity, doubtless believing that he would be protected by the British establishment. Carmichael's apologists will, of course, bleat about a "witch-hunt". I would remind them that their man is being condemned for cause. And very good cause, at that. This is in no way similar to, for example, the way Stewart Stevenson MSP was hounded from office as Transport Minister when he was absolutely blameless just so the British parties at Holyrood and their friends in the British media could claim a scalp. Carmichael has to go because he did something - in fact, several things - which even he has admitted would require his resignation. Which almost certainly means that the LibDems will be wiped out in Scotland. Mundell may well have to step down as Scottish Secretary if he cannot offer a satisfactory account of his own part in the affair, thereby creating another constitutional crisis as the Tory UK Government is forced to try and find someone else for the position. Or abolish the office of Scottish Secretary altogether. And Willie Rennie is, at the very least, weakened as leader by his craven defence of the indefensible. I wonder if Carmichael still thinks his attempt to smear Nicola Sturgeon was such a wizard wheeze. But there is more. Recall that the memo at the centre of this affair was actually fourth-hand as it derived from a telephone conversation about a telephone conversation about an account of a conversation given by someone who was not actually a party to the conversation at the heart of the matter, but merely a witness to it. It is perfectly legitimate to ask why the second of these telephone calls was made. And who gave the instruction for the call to be made. And for what purpose. Given the events currently under discussion, and the general behaviour of the British parties, it is only natural to be suspicious of everything they do. It does not seem beyond the bounds of credibility that the telephone call to the person who had made the telephone call to the French Consul General was a fishing expedition looking for something which could be spun into a bit of anti-SNP propaganda. Indeed, I suggested as much when the smear attempt against Nicola Sturgeon first surfaced. There may be a great deal more to this than has hitherto come to light. One person who may know more is Simon Johnson, the Telegraph journalist who was complicit in the original smear attempt. So far, he has escaped the kind of scrutiny that he deserves. We know for a fact that Johnson simply didn't bother to seek a response from any of the principals in the story. That he has kept his job after such a grievous dereliction of professional standards is a telling comment on how low the British media has sunk. But little or nothing has been said about what questions he asked of his source at the Scotland Office. Scurrilous journalists also tend also to be cowardly. Johnson would have sought assurances that his arse was covered. It is difficult to believe he wouldn't question the provenance of the story? What questions did he ask? What was he told that convinced him he would not put himself at risk by running the story? Did an experienced political journalist fail to even suspect a smear attempt? Did he just not care? One way or another, we have not heard the last of this. Labour's railing against David Cameron for supposedly "playing to English nationalism" is rather silly. It highlights their complete failure to recognise the new political reality in the UK. After all, what else was Cameron to do? While he would surely deny it with all the contrived vehemence he might muster, Cameron was implicitly accepting the fact that the political cultures in Scotland and England have now diverged to the extent that it is all but impossible for a political party to meaningfully address the electorates in both with a consistent, coherent message. Cameron merely opted to tailor his message to the voters who would actually decide the election. I repeat, what else was he supposed to do? British Labour in Scotland also recognised the need for a message tailored to Scotland's distinctive culture. This was clear from Jim Murphy's desperate and often comical efforts to portray himself as the real leader of a real party able to make real policy independent of the bosses in London. He convinced precisely nobody who wasn't inclined by dumb tribalism to be persuaded. While Cameron simply wrote Scotland off in order to deliver a consistent and coherent message to voters in England (or those parts of England which matter for electoral purposes), Murphy went a bit crazy. Then a bit crazier. His attempts to pretend that he was making policy while not straying too far from the British Labour Party line resulted in a message that was the very opposite of consistent and coherent. At times, it descended into gibberish. At other times he took the pretence of autonomy too far and was promptly slapped down by his bosses. And he made the whole thing worse by turning himself into a circus act performing his buffoonery for the inexplicably entranced media. The essential point in all of this is the increasing distinctiveness of Scotland's political culture. The "One Nation" factions in the British parties will still try to deny this even in the face of the decisive redrawing of the political geography of the UK in the recent election. But the direction of travel is entirely towards increasing divergence. And it is an accelerating process. Because England (if progressives there will forgive the generalisation) is moving in one direction at least as rapidly as Scotland is moving in the other. The sum of the speeds has reached escape velocity. The two political cultures have separated past the point of no return. Everything that happens from here on simply adds momentum to a process which leads ultimately to a formal ending of the now defunct political union and the opening of an opportunity to forge a new relationship between Scotland and England. Cameron's pursuit of English votes for English laws (EVEL); trade unions having different affiliations north and south of the border; increasingly different policy agendas being followed by the two governments; further constitutional tinkering creating more anomalies to irk Englanders while failing to satisfy Scotland's aspirations; the demise of British Labour in Scotland in favour of a genuine Scottish Labour Party; all of these things and more will be seen by future historians as both cause and effect of Scotland moving towards independence. The nature of the Tories' election campaign was very largely dictated by this process of political divergence between Scotland and England. British Labour's campaign in Scotland dealt rather more ineptly with the same irresistible historical forces. One suspects that at least a few of the more perspicacious minds in the unionist camp must have sensed which way the wind is blowing. Will they continue a Cnutian resistance? Or will they recognise the need to start managing the process of unravelling an archaic and dysfunctional political union? People hoping for British Labour in Scotland to deserve a revival will read Richard Baker's offering over at Labour Hame and despair. Baker evinces all the follies and fallacies which have brought the pretendy wee "Scottish Labour Party" to where it now finds itself - languishing in the remaindered bin of Scottish politics. In the first place, he imagines that there is a "Scottish Labour Party" to be saved. He stubbornly refuses to acknowledge the true subordinate status of British Labour in Scotland. Not a good start for somebody supposedly seeking a way out of its travails. We'll gloss over the bit where Baker tries to present Jim Murphy as a unifying figure on the assumption that it is a regrettably discordant attempt at humour. Of more significance is his attempt to portray the superficial, trivial changes to British Labour in Scotland's "constitution" as if they were profound and meaningful. I have news for Richard Baker. Adding the word "patriotic" served only to make you look more like Better Together and so remind people of your shameful alliance with the Tories in a truly despicable campaign to deny the sovereignty of Scotland's people. There is planet-weight unintended and unfunny irony in your use of that word that does not elude others as it evidently does yourself. The reason for adopting the word "patriotic" is also based on one of the follies and fallacies that I referred to earlier. Richard Baker displays the complete failure to understand the nature of his nemesis when he contemptuously, and erroneously, dismisses the SNP as being "most comfortable" in the territory of national identity rather than progress. I have another bit of news for Richard Baker. The SNP didn't win the trust of half the electorate by waving a saltire. Or by banging on about how "patriotic" they are. I could explain at length how and why that trust was won. But I'll settle for two words which, I think, sum up the SNP's approach and their appeal to voters - principled pragmatism. But the greatest obstacle of all to Richard Baker being the one to discover a path to redemption for British Labour in Scotland is his fervent British nationalism. His main argument against British Labour in Scotland taking the logical first step on the road to becoming electable is that becoming a genuine Scottish Labour Party would involve sacrificing its status as part of the British establishment. Avoiding any concessions to the distinctness Scotland's of Scotland's political culture takes precedence over even considerations of political survival. The voters have sent British Labour in Scotland an unmistakeable message which says that there is a new political reality in Scotland. Richard Baker responds with the dumb denial that has characterised British Labour in Scotland ever since the SNP's first Holyrood administration and despite the message being repeated ever more forcibly in 2011 and again last week. If British Labour in Scotland are listening as intently as they constantly assure us they are, how have they managed to miss that message from the electorate? When the political map of the UK slaps them in eye with the blindingly obvious fact of massive political divergence between Scotland and the rest of the UK, how can they remain so stubbornly oblivious? If Richard Baker is speaking for British Labour in Scotland then we might as well give up on them completely. They are beyond rehabilitation. Once again, David Cameron's first instinct is to deliver a contemptuous slap in the face to the people of Scotland. After the referendum, it was talk of English votes for English laws (EVEL) and his decision to arbitrarily impose conditions on delivery of the infamous "vow" signed up to by the British parties in the panicky final days of the referendum. The Smith Commission itself was a further slap in the face for Scotland. A rigged talking-shop charged with rationalising the withholding of powers from the Scottish Parliament while maintaining the pretence of honouring the "vow". The entire 2015 UK General Election campaign was one long slap in the face for Scotland as the British parties vied with one another in a contest to find who could best pander to the basest and most ill-informed prejudices of their target voters in England. And now, Cameron responds to Scotland's unequivocal affirmation of its distinct political identity with his his own contradictory affirmation of a "One Nation" dogma that disdainfully declares irrelevant and unworthy the democratic voice of the people of Scotland. How should we react to this. With anger? Of course! But not with rage. Our anger is righteous. But it must also be controlled. It must be directed. It must energise a movement to defend the fundamental democratic rights of Scotland's people against a British state which sees those rights as an inconvenience; an obstacle to the "One Nation" (Greater England) project; and a threat to the very structures of power, privilege and patronage which define the British state. We must put our trust the people we have elected. We must recognise that our SNP MPs will have the difficult task of working within a corrupt, archaic Westminster system which does little more than pay lip service to their right to be there. And do so while maintaining the principled pragmatism that helped them win an unchallengeable mandate from the people of Scotland. We will not always agree with everything that our representatives do in our name. But we must allow that compromise is part of democracy and that it is sometimes necessary to grit your teeth and tolerate some discomfort for the sake of achieving a greater objective. But while we support those who now speak for us in the British parliament, we must never lose sight of the fact that, ultimately, it is our voice, the voice of the people of Scotland, which takes precedence. Sovereignty is ours. We merely lend it to our elected representatives in order that they can use our power to serve our interests. If the British parties in Scotland, and particularly British Labour, had remembered this essential truth they might have fared better. As it is, they lost sight of their role. They forgot their place. And they have been chastised for it. We have replaced those who failed us with those in whom we have faith. I do not for one moment doubt that those 56 SNP MPs will prove themselves worthy of our trust - even as I recognise that they are human and subject to the same flaws and frailties as any of the rest of us. As the people of Scotland continue to speak with the powerful collective democratic voice that is the proud legacy of the aspirational Yes movement, we should be wary of undermining our MPs with petty squabbles that will be spun by the British media as major divisions. Criticism should be considered and constructive. That seems no less than obviously sensible. But continue to speak we must! There are important battles to be fought on many fronts to secure social justice and sustainable prosperity. Much of this campaigning will be, to a greater or lesser extent, in tune with what our elected representatives are doing on our behalf. It will lend strength to their efforts to steer the UK Government away from such follies as continued austerity and the squandering of resources on weapons of mass destruction. Some of the campaigning will not be so helpful. So be it! We can live with a diversity of views. We are enriched by diversity. It is to be hoped only that such campaigning should not put unreasonable pressure on SNP MPs to deliver something they cannot. There can be no turning of the other cheek. We must meet Cameron's arrogant scorn with a response that is resolute but measured. The more he refuses to accept the reality of the new political landscape, the greater must be our effort to put that reality beyond the denial of everyone but the most blinkered bigot. The starting point must be an affirmation of the sovereignty of the people of Scotland and of the right of self-determination that this implies. Let there be no mistake, these things are under imminent threat from the British establishment. We must raise our voice in determined defiance. Part of this defiance is a movement called Referendum 2018. Its initial aim is to demand that all parties standing candidates in the 2016 Scottish Parliament elections should include in there manifestos an affirmation of the sovereignty of Scotland's people and of Scotland's right of self determination. The longer-term aim of Referendum 2018 is to be a focal point for the popular demand for a second referendum on the issue of restoring Scotland's rightful constitutional status which will inform and influence party policy on the matter. An editorial appeared in The Independent yesterday (Tuesday 5 May) under the title In defence of liberal democracy which nicely encapsulates the attitude of the British establishment to Scotland and our elected representatives, albeit in in terms somewhat less hysterical and vitriolic than we are accustomed to from the British media. I would like to respond. It is a fragile kind of democracy that can be broken merely by its functioning. It is a fatally flawed democratic system that cannot cope with the people voting according to the dictates of their conscience. It is not democracy at all which, not only passively disregards large sections of the populace as a matter of casual indifference, but actively excludes them as a matter of policy. The Independent is concerned with the ability of government to "reflect the temper of the people". But only so long as that temper reflects the interests of established power. Should the temper of the people be such that they choose to challenge the old order and the old ways, those choices are deemed to be inherently illegitimate and invalid. Why this urgency to cast the SNP in the role of an ill-intentioned alien force? Why the vilification and demonisation? It cannot be explained by the nature of the party. This is a left-of-centre social democratic party such as would be considered mainstream in most of Europe. In terms of membership, it is the third largest party in the UK. Its leaders are consistently voted the most trusted in the UK. It has been the party of government in Scotland for eight years and an effective democratic opposition since the Scottish Parliament was recalled. Most importantly, the SNP is set to gain an unequivocal, even an overwhelming mandate from the people of Scotland. A mandate such as no other party in the UK can lay claim to. That must count for something. It is not because the party espouses extreme policies. On social policy, the SNP is only thought outlandish by those who consider social conscience a sign of weakness and an unworthy substitute for heartless market forces. On economic policy, the SNP is only thought heretical by those who are unthinkingly wedded to the cult of austerity and rigid neo-liberal orthodoxies. It cannot be because the SNP is a "nationalist" party. Nationalists of one hue or another have been at least tolerated within the British political system for as long as anybody can remember. It cannot be because the SNP seeks ultimately to restore Scotland's rightful constitutional status. In the first place, the constitutional question was parked by last years referendum and is not an issue in this election. In this election, the SNP stands, not for independence from the UK, but for ensuring that Scotland has the place within the UK that we were assured was our right should we vote to remain. And independence is, in any case, a perfectly valid choice if and when the people of Scotland should make it. Scotland's democratic right of self-determination was recognised by the Edinburgh Agreement and is guaranteed by the Charter of the United Nations. Fervent unionists talk of the union as if it was divinely ordained and imbued with an unchallengeable right to persist. In reality, it is just another political arrangement. Albeit an anachronistic, dysfunctional arrangement contrived in ancient times to serve the interests of the ruling elites whose descendants continue to be the principle beneficiaries. It is an arrangement considered unsatisfactory by the vast majority of the people of Scotland, including many of those who were not prepared to take the logical step and end it in favour of building something better suited to our times and circumstances. It is an arrangement that even unionists accept is unsatisfactory. Hence, the turd-polishing efforts of incessant constitutional tinkering. The union has a right to exist only so long as the (nominally) equal partners in the arrangement maintain their consent. In a democracy, there must be a facility for that consent to be tested at whatever juncture this may be required by a sufficient body of opinion in any party to the arrangement. The SNP's aim of independence for Scotland is very far from being a rational excuse for compromising fundamental principles of democracy. And, as has already been noted, it is not an issue in this election anyway. So, the question remains, why is the SNP being treated as it is by the British establishment? The answer can be summed up in one word - success! The reason the SNP is being reviled by the British establishment is that it has successfully mobilised popular opinion in Scotland. And, moreover, threatens to provoke similar mobilisation of popular opinion in the rest of the UK. It is not actually the SNP that the Westminster elite fear and hate. It is the democratic force behind the SNP. The SNP is merely the agency through which the people of Scotland are acting. It is the voice of the people that established power fears and abhors. It is not "liberal democracy" which is being defended here. What is actually being defended are the structures of power, privilege and patronage which define the British state. The SNP is not a threat to democracy. It is part of democracy. A vital component functioning precisely as it should. It's success is a manifestation of democracy in action. And if that makes established power uncomfortable then THEY are the problem, not the SNP. I had to chuckle at the thought of Alex Salmond being kept on a "short leash" as Daniel Sanderson suggests in The Herald. Only somebody mired in the machinations of British politics could suppose such a thing. Only somebody who sees all politics as being defined by the way the "Great British Duopoly" operates. With a few notable exceptions, political journalists have been struggling to cope with the new Scottish politics that is the legacy of the Yes campaign. Not that the transformation has been dramatic in any absolute sense. But the dynamic in Scotland is sufficiently different from what the British media's hacks are accustomed to that they have been left floundering in incomprehension. We see this in the way that everything is brought back to the familiar old Tory/Labour dichotomy with all its faux rivalries. Whatever party or parties are being discussed - SNP, Plaid Cymru, Greens etc. - they are invariably treated as if they have significance only in terms of their relationship to the "big two". They can have no significance of their own in the wider political context. The question is never - or vanishingly rarely - what does the advance of this or that party mean? It is almost always, what does the rise of this or that party mean for Labour and/or the Tories. One is left wondering how long it will take before commentators finally get their heads around the fact that the age of two-party politics is over. Perhaps this inertia will only be overcome when this reality dawns on those who run the two main British parties. Back to Alex Salmond. He is imagined to be "on a short leash" because that is what would happen in the old parties. It simply doesn't occur to those making such facile assumptions that Salmond could be keeping a relatively low profile of his own volition - simply because it is politically wise to avoid any distraction from the main election battle and the person who is the unquestioned figurehead of the SNP's advance. For journalists unfamiliar with anything other than the venal snake-pit of British politics, it is unthinkable that there should not be some bitter rivalry between Nicola Sturgeon and her predecessor. Their default assumption is that Alex Salmond must resent Sturgeon's success. And they will cling to this assumption regardless of the total lack of so much as the merest hint of tension between the two. If friction does not exist, it must be invented in print. 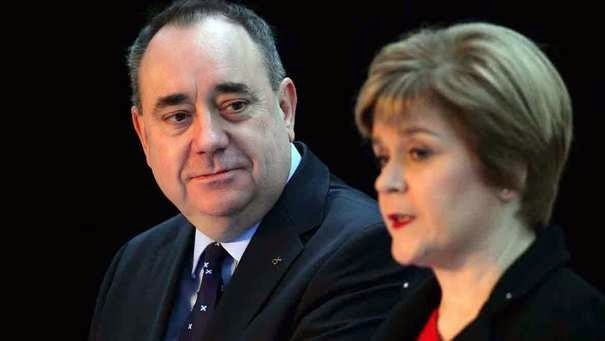 The reality is that both Salmond and Sturgeon are masterly political operators who have a great deal of respect for one another. There is no friction because each has a role to play and each is fully aware of the importance of their respective roles. Most importantly, neither Salmond nor Sturgeon are driven by personal ambition. At least, not exclusively. And certainly not to the extent that the leading players in the British parties are. Such personal ambition as they have is very much subordinate to the cause that they share. The cause of representing the interests of the people of Scotland. If those interests are best served by Alex Salmond taking something of a back seat, he won't need urging from Nicola Sturgeon or anyone else. Incomprehensible as it may be to many journalists, he will follow political instincts attuned to the cause of Scotland rather than personal advancement. Journalists may not be able to recognise an attitude so rare among the politicians they are used to dealing with. But the people see it. To those journalists, I offer this advice. Next time you are watching Nicola Sturgeon (or Alex Salmond) among a crowd, don't look at them. Instead, study the faces of the people around them. That thing you're seeing is called respect. I see snivelling Gordon Rayner (left), Chief Reporter at The Telegraph, is having himself a wee petulant tantrum* because everybody in Scotland didn't drape themselves in a union jack and take to the streets in a Dervish-dance of transported joy to celebrate the birth of another bairn destined for a life of unearned privilege and imposed parasitism. Doubtless Gordon feels better for having vented some of his excess of righteous indignation at those Scottish newspapers which, inexplicably, chose not to disregard the election and other events of some consequence to give over acres of space to a birth that was perhaps somewhat less miraculous than those which occurred on the same day in considerably less pampered circumstances. But does his bitter hysteria excuse blatant lies? Apparently it does if you work for the most rabidly British nationalist rag in the realm to which, all unknowingly in her sweet innocence, said bairn lays claim. The statement that the SNP is seeking election in the hope of "pressing for another referendum on independence" is a blatant untruth, as repeatedly confirmed by Nicola Sturgeon. And, yes! I am also wondering what any of this has to do with the SNP anyway. Rayner bleats piteously about the "sniffy attitude of the Scottish press towards the royal Princess (Is there another kind?)". But surely it is he who is showing the greatest disrespect by trying to spin this grievance-laden guff into yet another gobbet of anti-SNP propaganda. One of the most shamelessly despicable episodes in the referendum campaign occurred in the final couple of weeks when Better Together activists were going around knocking on pensioners' doors telling them that they would lose their pension if they voted Yes. British Labour and their Tory allies took great pride in this contemptible tactic and credited it with having played a significant part in securing a No vote. The ploy was devised by the disreputable characters who ran Project Fear. Those same disreputable characters are now on the payroll of British Labour in Scotland. And they are still up to the same dirty tricks. 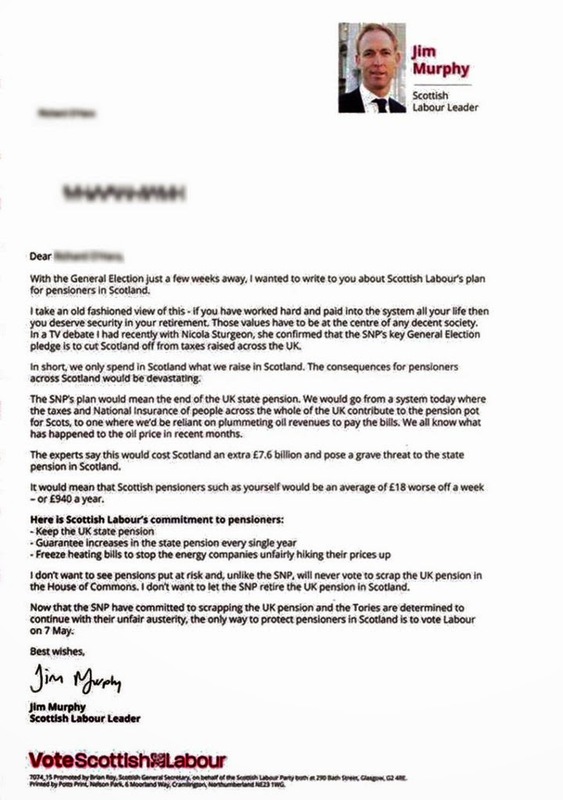 Pensioners across Scotland are complaining about a letter (above left) they have received from British Labour branch manager in North Britain, Jim Murphy. And no wonder! It is the most appalling litany of scaremongering, misinformation, distortion and downright dishonesty imaginable. A document that reeks of Murphy's fear and desperation as he faces richly deserved humiliation at the hands of Scotland's electorate. The letter starts with the claim that Nicola Sturgeon had "confirmed that the SNP's key General Election pledge is to cut Scotland off from taxes raised across the UK." This is a reference to full fiscal autonomy (FFA) which, far from being a "key pledge" is little more than a footnote in the SNP manifesto. Lie number one! And it is not a "pledge" at all. For the simple reason that SNP MPs at Westminster have no means to deliver FFA. A fact that mendacious Murphy is every bit as aware of as Nicola Sturgeon. The most that can be said about FFA is that the SNP favours such an arrangement. But Murphy knows full well that it isn't going to happen. Lie number two! The reason that FFA isn't going to happen is that, despite their infamous "vow" to deliver precisely that in the panicky final days of the referendum campaign, both British Labour and their Tory allies have now decided to renege on the promises they made to the people of Scotland. 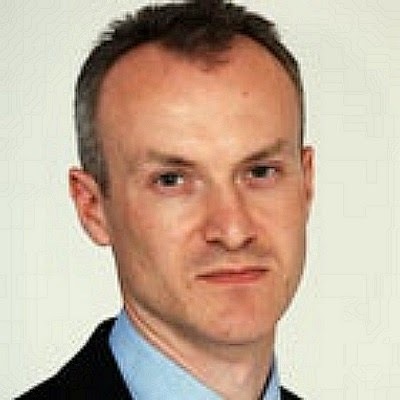 The very thing that Murphy is now shrilly portraying as being disastrous for Scotland's pensioners was, only a few months ago, being hailed by British Labour as the ultimate solution to the constitutional issue. Next, Murphy states that FFA would mean that "we only spend in Scotland what we raise in Scotland". Which is precisely what happens now. Except that what we raise in Scotland first has to pass through the British Treasury where huge chunks are siphoned off to pay for bloated and corrupt Westminster; infrastructure improvements in London; vanity projects to benefit the south; tax breaks for the rich; bank bail-outs; weapons of mass destruction; and the disastrous foreign military adventures that Murphy is so fond of. This is Murphy resorting to the tired old caricature of "subsidy junkie Scotland". A caricature which he and his fellow British nationalists repeatedly disowned during the referendum campaign even as they continued to peddle the "Too wee! Too poor! Too stupid!" line from the other side of their lying mouths. This insult is followed by a straightforward regurgitation of the lie that British Labour in Scotland were feeding to pensioners last September. The lie that independence/FFA would mean "the end of the UK state pension". But we know with absolute certainty that even independence would not have put pensions at risk. 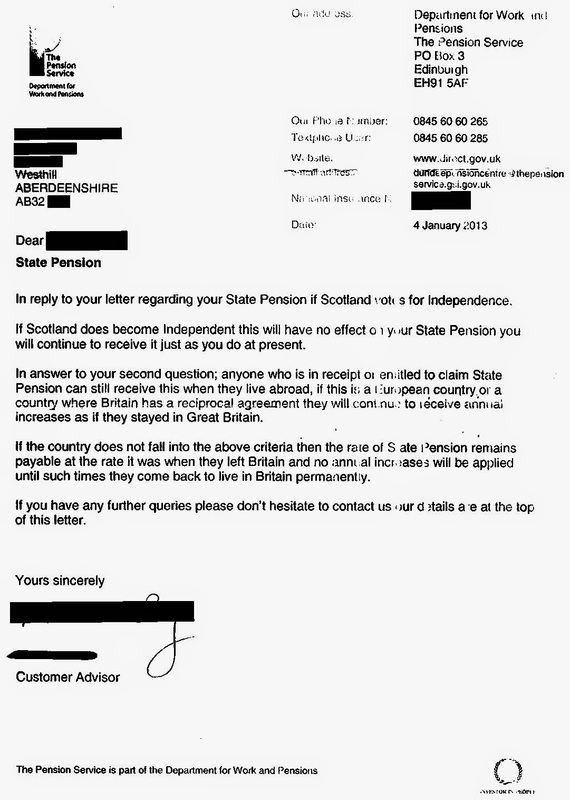 While Gordon Brown and others were busy trying to intimidate pensioners with scare stories about their pensions stopping the day after a Yes vote, the Department of Work and Pensions (DWP) was sending out letters (right) reassuring people that independence would have no effect on their pension entitlement. Murphy then repeats the lie about Scotland's pensions being subsidised by the rest of the UK (rUK) before descending into idiocy with the claim that pensions in Scotland would have to be funded from "plummeting oil revenues". Here, we get two lies for the price of one. In the first place, oil prices are not "plummeting". In fact, they have been recovering fairly steadily over recent months. The second part of this lie is truly idiotic in that Murphy tries to make out that Scottish pensions would be funded from oil revenues rather than from general taxation as at present. Complete nonsense, of course. Nonsense which, yet again, is based on the demeaning idea that Scotland is a poor nation. The reality is that everything we have in Scotland, including pensions, is 100% funded by tax revenues raised in Scotland. In fact, that's 100%+. Because in addition to funding our pensions and our public services, Scotland's taxpayers are obliged to pay what used to be called the "Imperial Premium" - a surcharge imposed to pay for all those "union benefits" listed earlier. Next up is a reference to the comprehensively discredited Institute for Fiscal Studies (IFS) claims of a £7.6bn deficit as a consequence of the FFA that, remember, isn't going to happen anyway. So why talk about it other than as an exercise in blatant scaremongering? The remainder of this malicious missive is taken up with sickeningly dishonest talk of the SNP "scrapping the UK pension". Murphy genuinely seems to suppose that the people of Scotland are so stupid we can't figure out that there is absolutely no way that the SNP could "scrap the UK pension". Even with the maximum 59 MPs, the SNP would be outnumbered ten to one. Those 59 MPs could only "vote to scrap the UK pension" for people in Scotland if such a measure was proposed by a Labour or a Tory UK Government. And no UK Government could propose such a thing because, as we know from the DWP, the state pension is guaranteed. It is a sovereign debt. Murphy ends with a repetition of the ludicrously dishonest claim that "the SNP have committed to scrapping the UK pension" garnished with a greasily disingenuous comment about the Tories being "determined to continue with their unfair austerity". As if we weren't aware that that British Labour is just as wedded to austerity fetishism as their Tory partners in the "Great British Duopoly". Murphy and British Labour in Scotland are clearly desperate. But nothing excuses such deceit and dishonesty. The whole of Scotland should condemn this vile strategy of terrorising pensioners. The whole of Scotland should punish the perpetrators on Thursday 7 May. We have an opportunity to rid our land of the liars who blight our politics. Let's seize it with both hands and send a message that shakes the entire British establishment to its foundations. The choice is simple. We either vote SNP or we empower lying reprobates such as Jim Murphy. The first draft of this article was binned because it had turned into a media studies lecture on audience theory and passive versus active consumption of media messages. What I propose instead is to offer a few tips on how to improve your media diet by changing the way you consume the messages that are fed to you. It seems too obvious to be worth saying that you can improve your media diet by varying it; by seeking out alternative and challenging sources of information. But you can also extract more intellectual nutrition from media messages by consuming them differently. 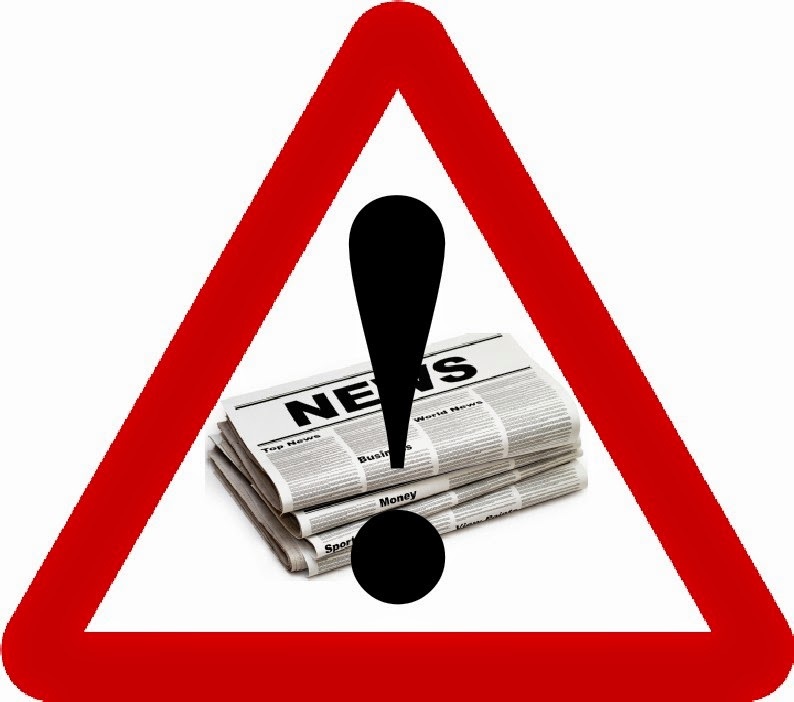 Always bear in mind that media messages - and here I am principally referring to political material - are presented to you in a particular way for a purpose. That purpose is not necessarily malign or mischievous. But the message is always contrived so as to be understood by the audience in a particular way. The secret to being an active consumer of media messages is to always seek your own understanding. There are some very simple tricks which can help. People tend to think of the headline as a means of flagging up what the story is about. It is better to think of it as an insight into the prejudices and intentions of those presenting the message. The headline tells you, not so much what the subject matter is, but how it is intended that you should understand what you are about to read. The order in which material is presented can also be a powerful way of manipulating the way it is understood by the casual consumer. Those presenting the message know that few people will read beyond the first two or three paragraphs. The stuff they want you to have in your head will always come first. Not least because, even if it isn't all you read, it will colour your understanding of what comes after. You can confound any devious intent by the simple expedient of reading the final two or three paragraphs first. In a typical politics article in a unionist newspaper such as The Scotsman, this will usually be the paragraph which begins, "A spokesperson for the Scottish Government said...". Essentially, it is the bit that the newspaper is obliged to include in order to justify a claim to "balance". Another approach is to filter out everything other than the part of the message which can be characterised as meaningful information. You may be surprised by how little factual content you find, even if you are being generous in your interpretation. This is part of the process of analytical thinking, which can easily become a habit with a little perseverance. As well as breaking the message down into its component parts and considering how these relate to each other and create meaning, thinking analytically involves questioning everything - including your own assumptions. Never accept the obvious meaning. But, while seeking your own understanding, beware of creating a meaning which is not justified by the content. Watch out for weasel words and trigger words. Words and phrases which seek to obfuscate or provoke an emotional reaction. Know them for what they are, and you will be immune to their effects. Mind the gap! Look for what is missing in the message. What is omitted can be every bit as meaningful as what is included. Beware the quagmire of statistics! When the message you are presented with is that "nearly half" are against something this is because it is avoiding saying that the majority are in favour. All of this is intended to provoke thought rather than provide a comprehensive list of rules. The purpose is to encourage a more mindful approach to media messages. To those who would have preferred the media studies lecture I offer both apologies and pity. This article was originally published in The Grist - #Issue 3.